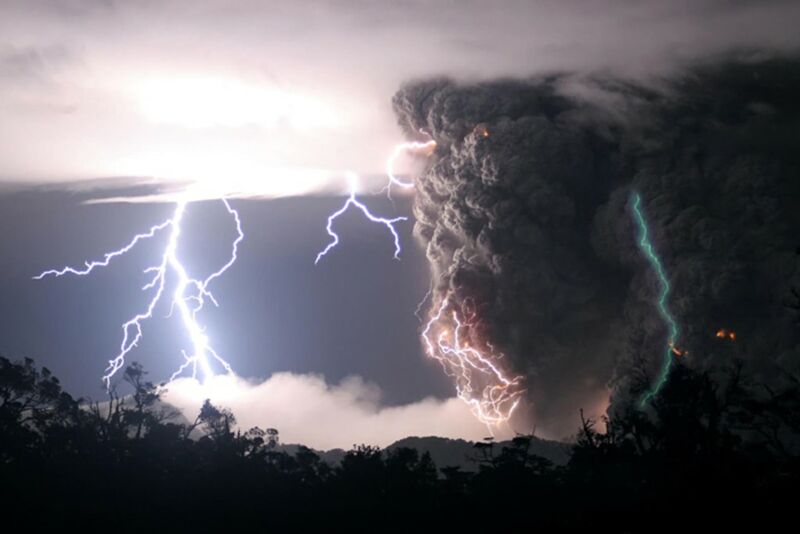 SAN FRANCISCO — A storm of charged particles coursing through a volcanic ash cloud sparked the spectacular green lightning seen at Chile's Chaiten Volcano in 2008, a researcher said here Monday at the annual meeting of the American Geophysical Union. The green lightning revealed an electrical dance normally hidden inside thunderclouds, Arthur Few, an atmospheric scientist at Rice University in Houston, said. "It probably occurs in all thunderstorms, but you never see it," Few said. "Because of the structure of charges in a volcano cloud, it's on the outside of the cloud." Two spectacular photographs, snapped when Chaiten erupted in May 2008, recently caught Few's eye when he was investigating volcanic lighting. The volcano looms over the Andes about 800 miles (1,285 kilometers) south of Santiago, Chile, and erupted on May 2 of that year after lying dormant for hundreds of years. A retired professor, Few said he was driven to explain the phenomenon simply out of curiosity. "I asked myself, 'My goodness, where does this come from and why don't we see this in lightning storms?'" he said. Few thinks that the volcanic green lightning strikes are what scientists call "streamers" — channels of positive charge surging from the ground to the atmosphere. In thunderstorms, these positively charged zones hide inside the clouds, carried on ice crystals, Few said. 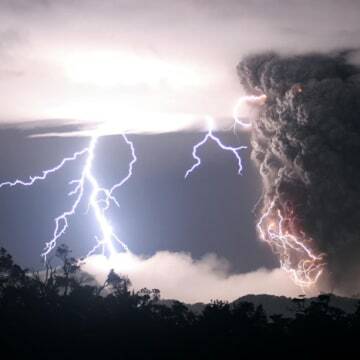 When the channels connect with clouds of negatively charged particles, lightning results. But volcanic ash reveals the streamers because ash particles swirl on the cloud's surface. "We rarely see that positive streamer because it's inside the cloud, but it is revealed when we look at a volcanic cloud," Few said. The green color comes from electrically excited oxygen atoms, similar to the phenomenon that produces the Earth's green aurora, he said. "It's basically the same physics," Few said. Email Becky Oskin or follow her @beckyoskin. Follow us OurAmazingPlanet @OAPlanet, Facebook and Google+. Original article at LiveScience's OurAmazingPlanet.